I am Dr. Sue Sabol (Chinese name is Suping Zhang). You may call me Dr. Zhang, because my university and patients from China and Japan know me as Dr. Suping Zhang. You can call me as Dr. Sabol as well as Dr. Zhang. I am a licensed acupuncturist, certified to practice acupuncture in Maryland by the Maryland State Board of Acupuncture. At age 17 I studied acupuncture under a famous Chinese acupuncturist. 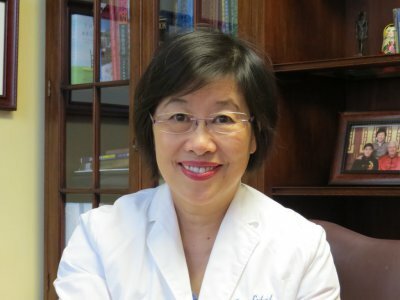 Later I have worked as Doctor of Surgery at the Dongzhimen Hospital affiliated with Beijing University of Chinese Medicine Hospital, as a resident of urology at Juntendo University, Tokyo, and as a postdoctoral behavioral genetic researcher at National Institutes of Health in Bethesda, Maryland, USA. I have had excellent training in both western medicine and Chinese medicine, specializing in treatment of pain, headaches, stroke, stress/anxiety,and infertility through the use of acupuncture (Chinese and Japanese styles), and herbology. 1974 -1978: Trained under a famous Chinese Acupuncturist at Yantai Traditional Chinese Medicine Hospital. Department dealing with stroke, pain, neurological rehabilitation. Main treatment of: anxiety, depression, insomnia, stroke, spinal cord pain, neck pain, back pain, sciatica, headache, knee pain, arthritis, auto injuries, sport injuries. 1978-1983: Student in Department of Medicine, Beijing University of Chinese Medicine, Beijing, China. 1983 - 1987: Doctor of Surgery at the Dongzhimen Hospital affiliated with Beijing University of Chinese Medicine Hospital, Beijing, China. Mainly treated cancer and infertility. stroke, pain, neurological rehabilitation (Western and Chinese medicines). 1987 - 1988: Residency in Urology, Juntendo University, School of Medicine, Tokyo, Japan. Cancer and pain rehabilitation treatment (Western and Chinese medicines). 1988- 1992: Graduate student in immunology, Juntendo University Postgraduate School of Medicine, Tokyo, Japan. Doctoral thesis on complement C3 pathway in major liver disease, liver cirrhosis. Also worked as part-time acupuncturist. treated stroke, pain, neurological rehabilitation.1992 - 1995: Postdoctoral fellow, Department of Microbiology, Uniformed Services University of the Health Sciences, Bethesda, MD. Performed research on diphtheria-toxin repressor. 1995 - 2000: Intramural Research Training Award (IRTA) Fellow: Laboratory of Biochemistry, National Cancer Institute, National Institutes of Health, Bethesda, MD. Behavioral genetic studies finding human genome sequence variations linked to anxiety-related traits, depression, cigarette smoking, personality traits, novelty seeking, and sexual orientation.2004-Present: Practice of acupuncture. Established in July 2005 my solo practice, Dr. Sue Zhang Sabol, Acupuncture and Chinese Medicine, in Bethesda, MD.